Select our delicious smoked turkey sausages for a quick and healthy alternative. Whether you’re preparing a quick dinner, or just need a morning pick-me-up, they’re perfect for just about any meal of the day! 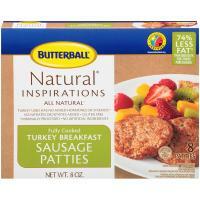 Not only do I enjoy the delicious goodness of a juicy, succulent Butterball Turkey, I also gain $5.00 worth of coupons towards my next Butterball Turkey. Thanks Butterball for making the best turkeys in the business!